When I visited home in February, I was so happy to get back and see all of my friends and family that I miss so much while I am living in Korea. 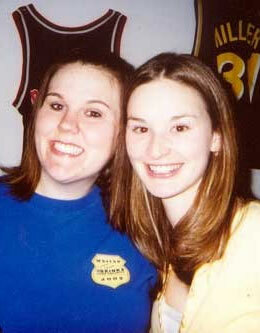 I was thrilled when I realized that I would be home for Melissa’s birthday. Melissa is one of my very dear friends. We went to high school together, but we didn’t actually become friends until we bumped into each other at our university one day during our freshman year. This year, most of my friends are turning 29 and I wanted Melissa to have a memorable beginning to the last year of her 20’s. I wanted us to spend the day performing Random Acts of Kindness (RAOK). 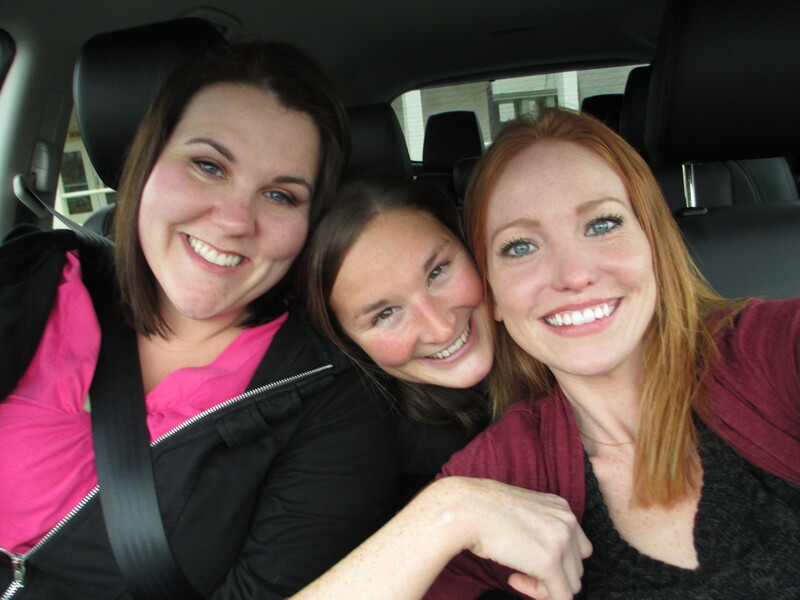 My sister-in-law, Mendi, and I planned out a big adventure for the three of us. 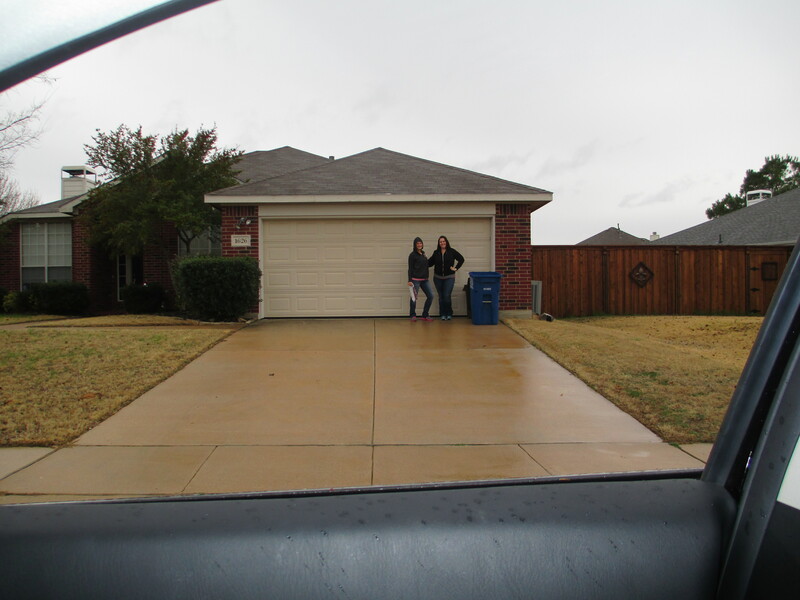 We only told Melissa to meet us at Mendi’s house so she had no idea what what we were doing. 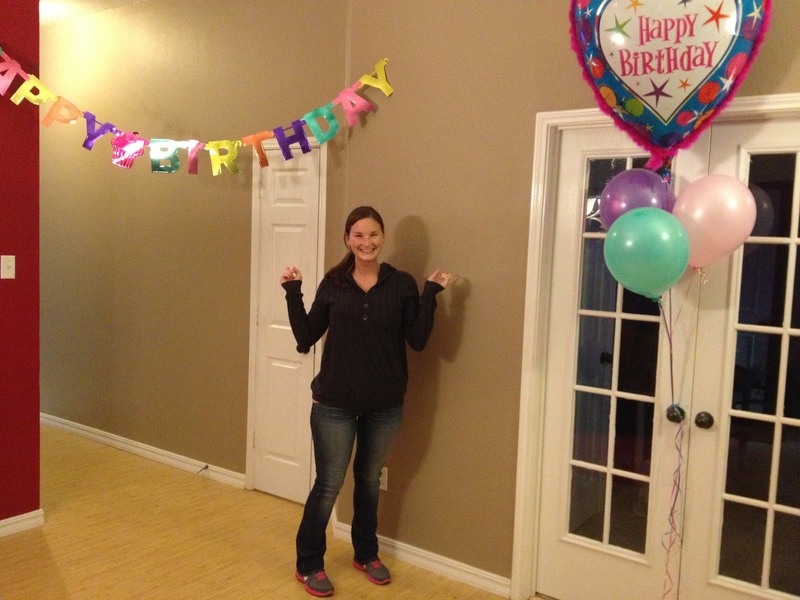 When Melissa got to the house, she received a warm welcome! Then we explained what the day had in store. It was a lot to take in, but she was excited! 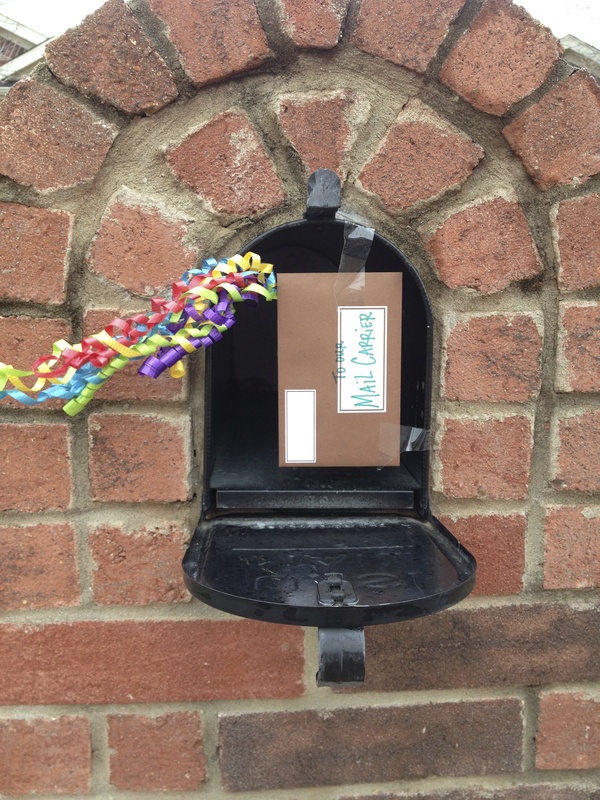 First on our list, was to write a thank you note for Mendi’s mail carrier. It was Trash Day in Mendi’s neighborhood so as we drove through, we pulled people’s trash cans up to their garages. And we took newspapers to their front doors so they wouldn’t get soaked in the rain. 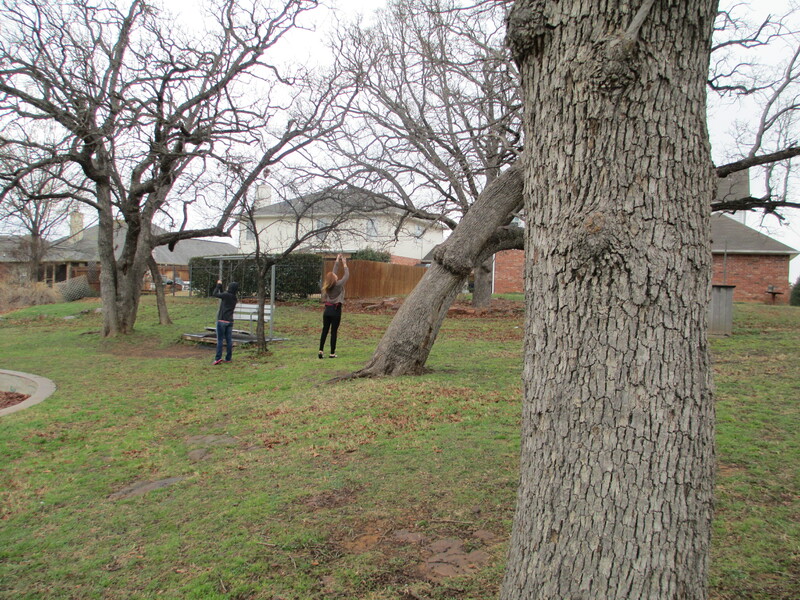 Next, we headed to the park to hang a few bird feeders. We thought even the birds could use a RAOK. We headed to the nail salon next to get some much needed pampering! Mendi and Mel had no idea that I had actually gone in earlier in the day to prepay for the 3 of us to get deluxe pedicures, something I knew neither one of them would ordinarily splurge on. The people at the spa were great! They even gave us some wine to enjoy during the pedicure. 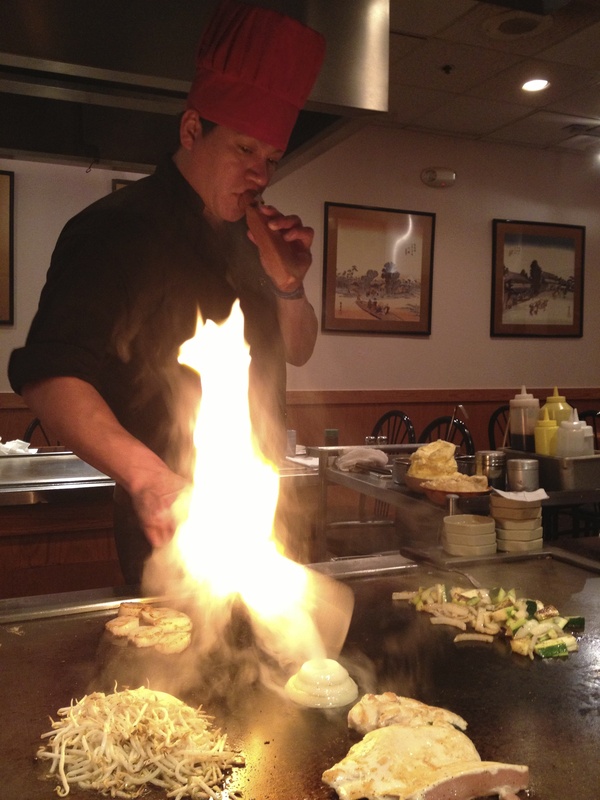 We continued to indulge ourselves a little longer and went to lunch at a hibachi grill. I think my favorite part of the day was our trip to the Dollar Tree. Mendi and I have been fascinated with RAOK for a while now so she had some cards made up which came in really handy. We each had 3 dollar bills (with RAOK cards attached) to place wherever we wanted throughout the store. And who doesn’t like finding money on the ground? So I strategically dropped a few dollars that day. In the parking lot, we placed notes on people’s cars that would hopefully bring a smile to their face. And occasionally left a dollar bill, too. We had bought some dog bones to hand out to people in Mendi’s neighborhood that were walking their dogs, but it was rainy so we didn’t see anyone. We decided that we would put a few in baggies and place them on some of the cars that were parked outside of the pet store nearby. We also had bottles of water to hand out, but we were only able to hand out one to a delivery man. He was really thankful. Another really cool part of our day was when we pulled up next to a young guy at the drive through of a McDonald’s and handed him a $5 McDonald’s gift card. I think at first we scared him, but he was so happy and his reaction was really heartwarming. You could tell that we had really made his day. Next, we headed over to Walmart. Each of us had a $5 Walmart gift card so we were able to pick one person to surprise at the store. The reactions were really mixed. I think most people didn’t believe that someone would just be giving them free money with no conditions. I’d like to believe that the people that were less than friendly reflected back on it later and smiled. I did get a really great reaction out of an elderly woman. She didn’t say anything at first so I was worried that she couldn’t hear me, but eventually she acted shocked and thanked me greatly. We had a leftover dollar from the dollar store so we found a good hiding place for it. 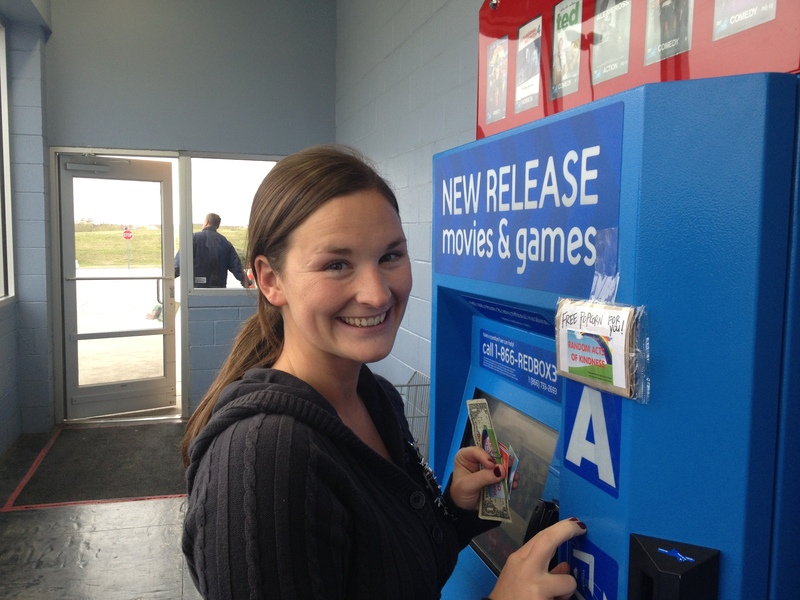 And we visited the Redbox machines to leave a little gift for the next movie renter. 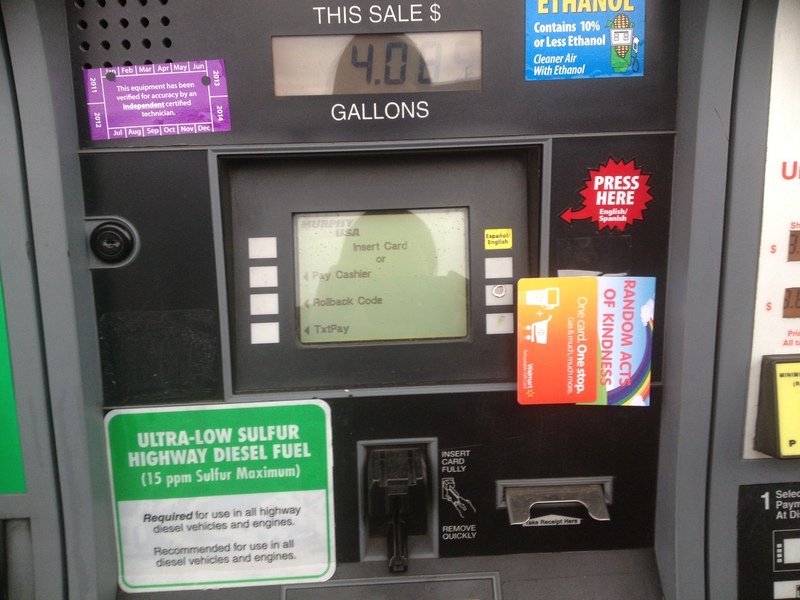 While we were leaving Walmart we stopped by the gas pumps and left this. It was just for $5, but every little bit helps! As we headed back towards home, we stopped by the local car washes and taped some quarters to the machines there. And stopped by the post office to mail some cheery letters to some sick children. 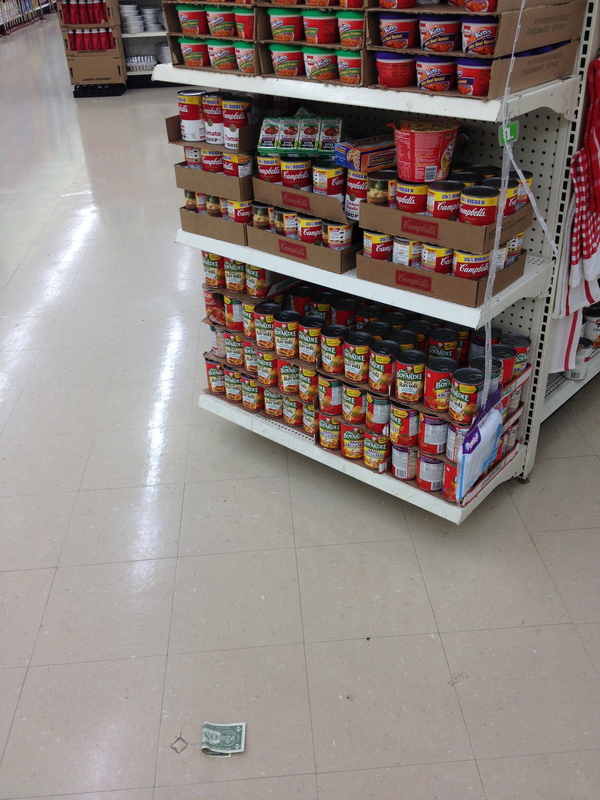 Finally, we headed to the local food pantry to make a donation of some things I had purchased a few days before. It was a great day that I’m pretty sure we will all remember forever. 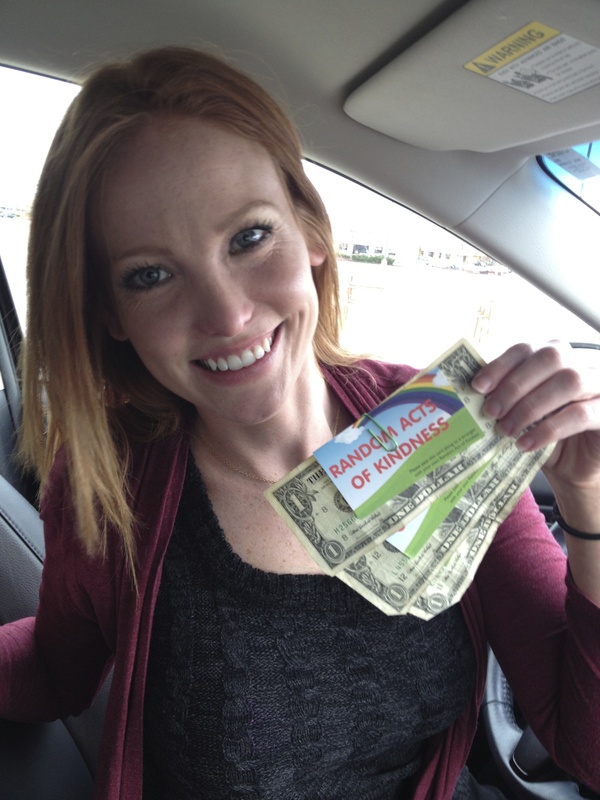 This entry was posted in Life in Texas, Random Acts of Kindness (RAOK) and tagged birthday, dollar store, Dollar Tree, hibachi, kindness, pay it forward, pedicure, Random Acts of Kindness, RAOK, surprise party by Meagan & Dave | HappilyEverExpat.com. Bookmark the permalink. Really amazing post – I love the idea of RAOK!! You guys are excellent at life :D! Thanks a lot! I love the idea, too! Can’t wait to do more. Thanks, Wendy! You’re so sweet. You always make my day a little brighter! Very sweet idea. I always think about doing something like this, but then I’m not sure what to do. You gave me lots of good ideas. Thanks. I’m so in love with you and your friends for doing this! Absolute proof that it is the thought that counts. 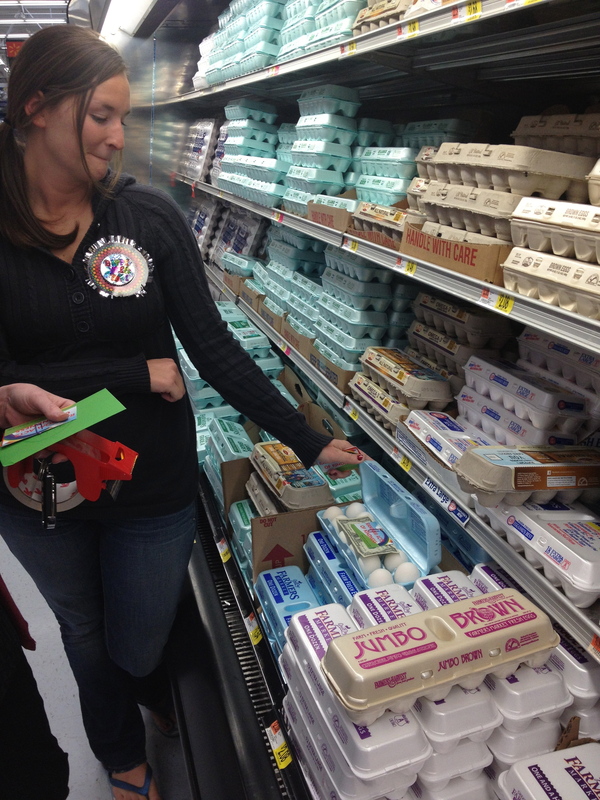 I’m sure I would cry if I found a dollar inside my grocery store eggs – amazing!! I love that you would cry if you found a dollar in your eggs. I hope the person that found it felt just as special. Thanks for reading! This is lovely! Its good to see that there is still such kindness in the world!! Would love to get involved! If you want any more ideas on RAOK, let me know. I think the most fun we had was hiding dollars at the dollar store. Such an easy thing to do and it brought us (and I’m sure whoever found them) so much joy! This is seriously awesome! I LOVE this kind of stuff and would love to have some cards made up like that. So cool!!! You can get them done pretty inexpensively online. I can ask my sister-in-law which company she used if you’re interested? Just let me know. Thanks for reading! Love it! What a great way to spend your birthday – or really any day. What you did is truly inspiring. My kids and I have been planning something similar when school lets out. Smaller bursts throughout the entire summer, rather than all in one day. I love the little cards! What a great idea. Thanks for setting such a heartwarming example for others to follow. Thank you. We had so much fun doing it and it was so fulfilling. I love this! Especially the Dollar Store and the Car Wash! This post really inspired me! Thank you. We had such a great time making people’s days a little brighter. I wish I could do it more often, but there’s a bit of a language and cultural barrier here in Korea. Thanks! It was a really awesome day. A day we’ll never forget.